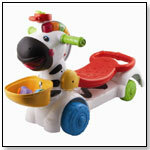 The 3-in-1 Learning Zebra Scooter grows with your child and is ideal for little ones on the go. It easily converts from riding to pushing and scooting as your infant begins to walk so the fun keeps on rolling. Lights and music entertain as infants learn colors, numbers and sounds with this versatile toy that keeps going and growing.